These gorgeous pure squirrel hair square-edged locks are fixed with hand-tied quills to this unique chiqueter brush. 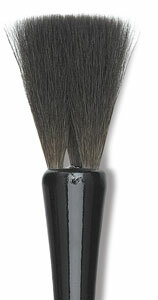 The brush features a long, round, black handle. This chiqueter brush contains square edged locks.